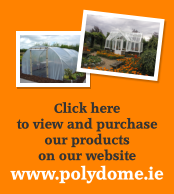 Just to let you know that all went according to plan with the erection of the polydome last week. We used a full strip foundation with an angle iron bolted down to it and welded the upright bars to it. It can be removed and moved to a new location in the future if need be. The side rails worked well and the plastic clipped in satisfactorily all round with no ripples –looks great.